My primary interests as a climate scientist are in the realm of studying and modeling climate-carbon cycle interactions, the ocean’s role in the climate system, and the development of climate models with a particular focus on inter-annual variability and future climate change. I also develop “big data” diagnostics, metrics, and analyses to help benchmark and analyze climate model results. In a paper published in Nature Geoscience, we demonstrate that basin scale differences in heat uptake and sea level rise (SLR) are a forced response from increasing atmospheric carbon dioxide concentrations, and the inter-basin differences vary with emission rate (see figure). Weaker overturning circulations in the Atlantic in the higher emission scenarios (i.e. > 5 GtC yr-1) make the ocean interior both warmer and less ventilated and are associated with enhanced Atlantic sea level rise, relative to the Pacific. In this paper, we also explore basin-averaged SLR through the lens of cumulative carbon emissions. Does TCRE depend on the rate of carbon emissions? Our paper was also highlighted in the April 2014 issue of Nature Climate Change. Eyring, V, P Cox, G M Flato, P J Gleckler, G Abramowitz, P Caldwell, W D Collins, B K Gier, A Hall, F Hoffman, G C Hurtt, A Jahn, C Jones, Stephen A Klein, and John P Krasting, et al., February 2019: Taking climate model evaluation to the next level. Nature Climate Change, 9(2), doi:10.1038/s41558-018-0355-y. Earth system models are complex and represent a large number of processes, resulting in a persistent spread across climate projections for a given future scenario. Owing to different model performances against observations and the lack of independence among models, there is now evidence that giving equal weight to each available model projection is suboptimal. This Perspective discusses newly developed tools that facilitate a more rapid and comprehensive evaluation of model simulations with observations, process-based emergent constraints that are a promising way to focus evaluation on the observations most relevant to climate projections, and advanced methods for model weighting. These approaches are needed to distil the most credible information on regional climate changes, impacts, and risks for stakeholders and policy-makers. Krasting, John P., Ronald J Stouffer, Stephen M Griffies, Robert Hallberg, Sergey Malyshev, Bonita L Samuels, and Lori T Sentman, November 2018: Role of Ocean Model Formulation in Climate Response Uncertainty. Journal of Climate, 31(22), doi:10.1175/JCLI-D-18-0035.1. Oceanic heat uptake (OHU) is a significant source of uncertainty in both the transient and equilibrium responses to increasing the planetary radiative forcing. OHU differs among climate models and is related in part to their representation of vertical and lateral mixing. This study examines the role of ocean model formulation – specifically the choice of vertical coordinate and strength of background diapycnal diffusivity (Kd) – in the millennial-scale near-equilibrium climate response to a quadrupling of atmospheric CO2. Using two fully-coupled Earth System Models (ESMs) with nearly identical atmosphere, land, sea ice, and biogeochemical components, it is possible to independently configure their ocean model components with different formulations and produce similar near-equilibrium climate responses. The SST responses are similar between the two models (r2 = 0.75, global average ∼ 4.3 °C) despite their initial pre-industrial climate mean states differing by 0.4 °C globally. The surface and interior responses of temperature and salinity are also similar between the two models. However, the Atlantic Meridional Overturning Circulation (AMOC) responses are different between the two models, and the associated differences in ventilation and deep water formation have an impact on the accumulation of dissolved inorganic carbon in the ocean interior. A parameter sensitivity analysis demonstrates that increasing the amount of Kd produces very different near-equilibrium climate responses within a given model. These results suggest that the impact of the ocean vertical coordinate on the climate response is small relative to the representation of sub-gridscale mixing. Sentman, Lori T., John P Dunne, Ronald J Stouffer, John P Krasting, J R Toggweiler, and Anthony J Broccoli, July 2018: The Mechanistic Role of the Central American Seaway in a GFDL Earth System Model. Part 1: Impacts on Global Ocean Mean State and Circulation. Paleoceanography and Paleoclimatology, 33(7), doi:10.1029/2018PA003364. To explore the mechanisms involved in the global ocean circulation response to the shoaling and closure of the Central American Seaway (CAS), we performed a suite of sensitivity experiments using the Geophysical Fluid Dynamics Laboratory Earth System Model (ESM), GFDL‐ESM 2G, varying only the seaway widths and sill depths. Changes in large‐scale transport, global ocean mean state, and deep‐ocean circulation in all simulations are driven by the direct impacts of the seaway on global mass, heat and salt transports. Net mass transport through the seaway into the Caribbean is 20.5‐23.1 Sv with a deep CAS, but only 14.1 Sv for the wide, shallow CAS. Seaway transport originates from the Antarctic Circumpolar Current in the Pacific and rejoins it in the South Atlantic, reducing the Indonesian Throughflow and transporting heat and salt southward into the South Atlantic, in contrast to present‐day and previous CAS simulations. The increased southward salt transport increases the large‐scale upper ocean density, and the freshening and warming from the changing ocean transports decreases the intermediate and deep‐water density. The new ocean circulation pathway traps heat in the Southern Hemisphere oceans and reduces the northern extent of Antarctic Bottom Water penetration in the Atlantic, strengthening and deepening Atlantic meridional overturning, in contrast to previous studies. In all simulations, the seaway has a profound effect on the global ocean mean state and alters deep‐water mass properties and circulation in the Atlantic, Indian and Pacific basins, with implications for changing deep‐water circulation as a possible driver for changes in long‐term climate. Findell, Kirsten L., Alexis Berg, P Gentine, John P Krasting, B R Lintner, Sergey Malyshev, J A Santanello, and Elena Shevliakova, October 2017: The impact of anthropogenic land use and landcover change on regional climate extremes. Nature Communications, 8, 989, doi:10.1038/s41467-017-01038-w.
Land surface processes modulate the severity of heat waves, droughts, and other extreme events. However, models show contrasting effects of land surface changes on extreme temperatures. Here, we use an earth system model from the Geophysical Fluid Dynamics Laboratory to investigate regional impacts of land use and land cover change on combined extremes of temperature and humidity, namely aridity and moist enthalpy, quantities central to human physiological experience of near-surface climate. The model’s near-surface temperature response to deforestation is consistent with recent observations, and conversion of mid-latitude natural forests to cropland and pastures is accompanied by an increase in the occurrence of hot-dry summers from once-in-a-decade to every 2–3 years. In the tropics,long time-scale oceanic variability precludes determination of how much of a small, but significant, increase in moist enthalpy throughout the year stems from the model’s novel representation of historical patterns of wood harvesting, shifting cultivation, and regrowth of secondary vegetation and how much is forced by internal variability within the tropical oceans. Naiman, Z, P J Goodman, John P Krasting, Sergey Malyshev, J L Russell, Ronald J Stouffer, and Andrew T Wittenberg, June 2017: Impact of mountains on tropical circulation in two Earth System Models. Journal of Climate, 30(11), doi:10.1175/JCLI-D-16-0512.1. Two state-of-the-art Earth System Models (ESMs) were used in an idealized experiment to explore the role of mountains in shaping Earth’s climate system. Similar to previous studies, removing mountains from both ESMs results in the winds becoming more zonal, and weaker Indian and Asian monsoon circulations. However, there are also broad changes to the Walker circulation and the El Niño Southern Oscillation (ENSO). Without orography, convection moves across the entire equatorial Indo-Pacific basin on interannual timescales. The ENSO has a stronger amplitude, lower frequency and increased regularity. A wider equatorial wind zone and changes to equatorial wind stress curl result in a colder cold tongue and a steeper equatorial thermocline across the Pacific basin during La Niña years. Anomalies associated with ENSO warm events are larger without mountains, and have greater impact on the mean tropical climate than when mountains are present. Without mountains the centennial-mean Pacific Walker circulation weakens in both models by ~45%, but the strength of the mean Hadley circulation changes by <2%. Changes in the Walker circulation in these experiments can be explained by the large spatial excursions of atmospheric deep convection on interannual timescales. These results suggest that mountains are an important control on the large-scale tropical circulation, impacting ENSO dynamics and the Walker circulation, but have little impact on the strength of the Hadley circulation. Eyring, V, M Righi, A Lauer, M Evaldsson, S Wenzel, C Jones, A Anav, O Andrews, I Cionni, E L Davin, C Deser, C Ehbrecht, P Friedlingstein, P J Gleckler, K-D Gottschaldt, S Hagemann, M Juckes, S Kindermann, and John P Krasting, et al., May 2016: ESMValTool (v1.0) – a community diagnostic and performance metrics tool for routine evaluation of Earth system models in CMIP. Geoscientific Model Development, 9(5), doi:10.5194/gmd-9-1747-2016. A community diagnostics and performance metrics tool for the evaluation of Earth system models (ESMs) has been developed that allows for routine comparison of single or multiple models, either against predecessor versions or against observations. 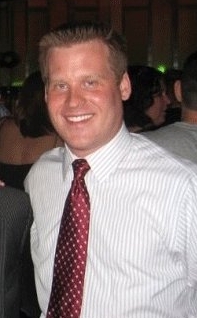 The priority of the effort so far has been to target specific scientific themes focusing on selected essential climate variables (ECVs), a range of known systematic biases common to ESMs, such as coupled tropical climate variability, monsoons, Southern Ocean processes, continental dry biases, and soil hydrology–climate interactions, as well as atmospheric CO2 budgets, tropospheric and stratospheric ozone, and tropospheric aerosols. The tool is being developed in such a way that additional analyses can easily be added. A set of standard namelists for each scientific topic reproduces specific sets of diagnostics or performance metrics that have demonstrated their importance in ESM evaluation in the peer-reviewed literature. The Earth System Model Evaluation Tool (ESMValTool) is a community effort open to both users and developers encouraging open exchange of diagnostic source code and evaluation results from the Coupled Model Intercomparison Project (CMIP) ensemble. This will facilitate and improve ESM evaluation beyond the state-of-the-art and aims at supporting such activities within CMIP and at individual modelling centres. Ultimately, we envisage running the ESMValTool alongside the Earth System Grid Federation (ESGF) as part of a more routine evaluation of CMIP model simulations while utilizing observations available in standard formats (obs4MIPs) or provided by the user. Griffies, Stephen M., G Danabasoglu, P J Durack, Alistair Adcroft, V Balaji, C Boning, E P Chassignet, E N Curchitser, J Deshayes, H Drange, B Fox-Kemper, P J Gleckler, J M Gregory, H Haak, Robert Hallberg, H T Hewitt, D M Holland, T Ilyina, J H Jungclaus, Y Komuro, John P Krasting, W G Large, S J Marsland, S Masina, T J McDougall, A J George Nurser, James C Orr, A Pirani, F Qiao, Ronald J Stouffer, K E Taylor, A M Treguier, H Tsujino, P Uotila, M Valdivieso, Michael Winton, and S G Yeager, September 2016: OMIP contribution to CMIP6: experimental and diagnostic protocol for the physical component of the Ocean Model Intercomparison Project. Geoscientific Model Development, 9(9), doi:10.5194/gmd-9-3231-2016. The Ocean Model Intercomparison Project (OMIP) aims to provide a framework for evaluating, understanding, and improving the ocean and sea-ice components of global climate and earth system models contributing to the Coupled Model Intercomparison Project Phase 6 (CMIP6). OMIP addresses these aims in two complementary manners: (A) by providing an experimental protocol for global ocean/sea-ice models run with a prescribed atmospheric forcing, (B) by providing a protocol for ocean diagnostics to be saved as part of CMIP6. We focus here on the physical component of OMIP, with a companion paper (Orr et al., 2016) offering details for the inert chemistry and interactive biogeochemistry. The physical portion of the OMIP experimental protocol follows that of the interannual Coordinated Ocean-ice Reference Experiments (CORE-II). Since 2009, CORE-I (Normal Year Forcing) and CORE-II have become the standard method to evaluate global ocean/sea-ice simulations and to examine mechanisms for forced ocean climate variability. The OMIP diagnostic protocol is relevant for any ocean model component of CMIP6, including the DECK (Diagnostic, Evaluation and Characterization of Klima experiments), historical simulations, FAFMIP (Flux Anomaly Forced MIP), C4MIP (Coupled Carbon Cycle Climate MIP), DAMIP (Detection and Attribution MIP), DCPP (Decadal Climate Prediction Project), ScenarioMIP (Scenario MIP), as well as the ocean-sea ice OMIP simulations. The bulk of this paper offers scientific rationale for saving these diagnostics. Krasting, John P., John P Dunne, Ronald J Stouffer, and Robert Hallberg, March 2016: Enhanced Atlantic sea-level rise relative to the Pacific under high carbon emission rates. Nature Geoscience, 9(3), doi:10.1038/ngeo2641. Thermal expansion of the ocean in response to warming is an important component of historical sea-level rise1. Observational studies show that the Atlantic and Southern oceans are warming faster than the Pacific Ocean2, 3, 4, 5. Here we present simulations using a numerical atmospheric-ocean general circulation model with an interactive carbon cycle to evaluate the impact of carbon emission rates, ranging from 2 to 25 GtC yr−1, on basin-scale ocean heat uptake and sea level. 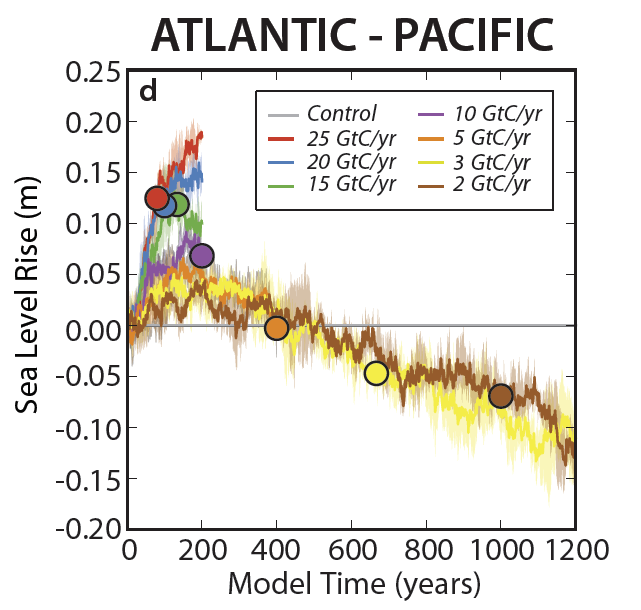 For simulations with emission rates greater than 5 GtC yr−1, sea-level rise is larger in the Atlantic than Pacific Ocean on centennial timescales. This basin-scale asymmetry is related to the shorter flushing timescales and weakening of the overturning circulation in the Atlantic. These factors lead to warmer Atlantic interior waters and greater thermal expansion. In contrast, low emission rates of 2 and 3 GtC yr−1 will cause relatively larger sea-level rise in the Pacific on millennial timescales. For a given level of cumulative emissions, sea-level rise is largest at low emission rates. We conclude that Atlantic coastal areas may be particularly vulnerable to near-future sea-level rise from present-day high greenhouse gas emission rates. Frölicher, T L., Jorge L Sarmiento, David J Paynter, John P Dunne, John P Krasting, and Michael Winton, January 2015: Dominance of the Southern Ocean in anthropogenic carbon and heat uptake in CMIP5 models. Journal of Climate, 28(2), doi:10.1175/JCLI-D-14-00117.1. We assess the uptake, transport and storage of oceanic anthropogenic carbon and heat over the period 1861 to 2005 in a new set of coupled carbon-climate Earth System models conducted for the fifth Coupled Model Intercomparison Project (CMIP5), with a particular focus on the Southern Ocean. Simulations show the Southern Ocean south of 30°S, occupying 30% of global surface ocean area, accounts for 43 ± 3% (42 ± 5 Pg C) of anthropogenic CO2 and 75 ± 22% (23 ± 9 *1022J) of heat uptake by the ocean over the historical period. Northward transport out of the Southern Ocean is vigorous, reducing the storage to 33 ± 6 Pg anthropogenic carbon and 12 ± 7 *1022J heat in the region. The CMIP5 models as a class tend to underestimate the observational-based global anthropogenic carbon storage, but simulate trends in global ocean heat storage over the last fifty years within uncertainties of observation-based estimates. CMIP5 models suggest global and Southern Ocean CO2 uptake have been largely unaffected by recent climate variability and change. Anthropogenic carbon and heat storage show a common broad-scale pattern of change, but ocean heat storage is more structured than ocean carbon storage. Our results highlight the significance of the Southern Ocean for the global climate and as the region where models differ the most in representation of anthropogenic CO2 and in particular heat uptake. Ding, Y, J A Carton, G A Chepurin, G Stenchikov, A Robock, Lori T Sentman, and John P Krasting, September 2014: Ocean response to volcanic eruptions in Coupled Model Intercomparison Project 5 (CMIP5) simulations. Journal of Geophysical Research, 119(9), doi:10.1002/2013JC009780. We examine the oceanic impact of large tropical volcanic eruptions as they appear in ensembles of historical simulations from eight Coupled Model Intercomparison Project Phase 5 models. These models show a response that includes lowering of global average sea surface temperature by 0.1-0.3 K, comparable to the observations. They show enhancement of Arctic ice cover in the years following major volcanic eruptions, with long-lived temperature anomalies extending to the mid-depth and deep ocean on decadal to centennial timescales. Regional ocean responses vary, although there is some consistent hemispheric asymmetry associated with the hemisphere in which the eruption occurs. Temperature decreases and salinity increases contribute to an increase in the density of surface water and an enhancement in the overturning circulation of the North Atlantic Ocean following these eruptions. The strength of this overturning increase varies considerably from model to model and is correlated with the background variability of overturning in each model. Any cause/effect relation between eruptions and the phase of El Niño is weak. Krasting, John P., John P Dunne, Elena Shevliakova, and Ronald J Stouffer, April 2014: Trajectory sensitivity of the transient climate response to cumulative carbon emissions. Geophysical Research Letters, 41(7), doi:10.1002/2013GL059141. The robustness of Transient Climate Response to cumulative Emissions (TCRE) is tested using an Earth System Model (Geophysical Fluid Dynamics Laboratory-ESM2G) forced with seven different constant rates of carbon emissions (2 GtC/yr to 25 GtC/yr), including low emission rates that have been largely unexplored in previous studies. 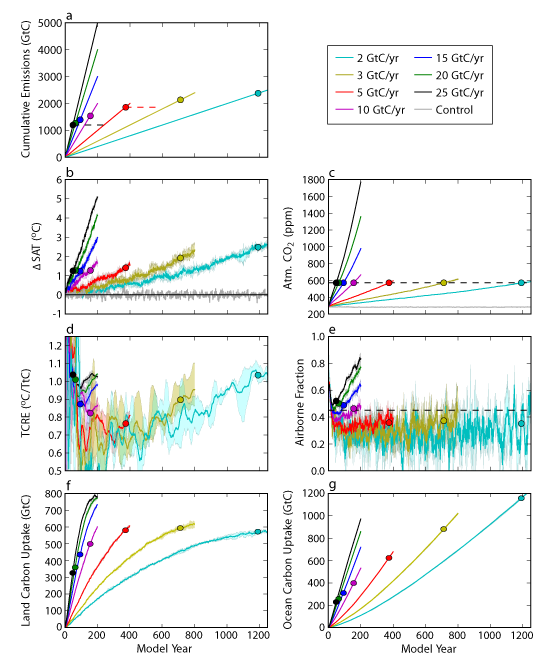 We find the range of TCRE resulting from varying emission pathways to be 0.76 to 1.04°C/TtC. This range, however, is small compared to the uncertainty resulting from varying model physics across the Fifth Coupled Model Intercomparison Project ensemble. TCRE has a complex relationship with emission rates; TCRE is largest for both low (2 GtC/yr) and high (25 GtC/yr) emissions and smallest for present-day emissions (5–10 GtC/yr). Unforced climate variability hinders precise estimates of TCRE for periods shorter than 50 years for emission rates near or smaller than present day values. Even if carbon emissions would stop, the prior emissions pathways will affect the future climate responses. Dunne, John P., Jasmin G John, Elena Shevliakova, Ronald J Stouffer, John P Krasting, Sergey Malyshev, P C D Milly, Lori T Sentman, Alistair Adcroft, William F Cooke, Krista A Dunne, Stephen M Griffies, Robert Hallberg, Matthew J Harrison, Hiram Levy II, Andrew T Wittenberg, Peter Phillipps, and Niki Zadeh, April 2013: GFDL's ESM2 global coupled climate-carbon Earth System Models Part II: Carbon system formulation and baseline simulation characteristics. Journal of Climate, 26(7), doi:10.1175/JCLI-D-12-00150.1. We describe carbon system formulation and simulation characteristics of two new global coupled carbon-climate Earth System Models, ESM2M and ESM2G. These models demonstrate good climate fidelity as described in Part I while incorporating explicit and consistent carbon dynamics. The two models differ almost exclusively in the physical ocean component; ESM2M uses Modular Ocean Model version 4.1 with vertical pressure layers while ESM2G uses Generalized Ocean Layer Dynamics with a bulk mixed layer and interior isopycnal layers. On land, both ESMs include a revised land model to simulate competitive vegetation distributions and functioning, including carbon cycling among vegetation, soil and atmosphere. In the ocean, both models include new biogeochemical algorithms including phytoplankton functional group dynamics with flexible stoichiometry. Preindustrial simulations are spun up to give stable, realistic carbon cycle means and variability. Significant differences in simulation characteristics of these two models are described. Due to differences in oceanic ventilation rates (Part I) ESM2M has a stronger biological carbon pump but weaker northward implied atmospheric CO2 transport than ESM2G. The major advantages of ESM2G over ESM2M are: improved representation of surface chlorophyll in the Atlantic and Indian Oceans and thermocline nutrients and oxygen in the North Pacific. Improved tree mortality parameters in ESM2G produced more realistic carbon accumulation in vegetation pools. The major advantages of ESM2M over ESM2G are reduced nutrient and oxygen biases in the Southern and Tropical Oceans. Hallberg, Robert, Alistair Adcroft, John P Dunne, John P Krasting, and Ronald J Stouffer, May 2013: Sensitivity of Twenty-First-Century Global-Mean Steric Sea Level Rise to Ocean Model Formulation. Journal of Climate, 26(9), doi:10.1175/JCLI-D-12-00506.1. Two comprehensive Earth System Models, identical apart from their oceanic components, are used to estimate the uncertainty in projections of 21st century sea level rise due to representational choices in ocean physical formulation. Most prominent among the formulation differences is that one (ESM2M) uses a traditional z-coordinate ocean model, while the other (ESM2G) uses an isopycnal-coordinate ocean. As evidence of model fidelity, differences in 20th century global-mean steric sea level rise are not statistically significant between either model and observed trends. However, differences between the two modelsâ€™ 21st century projections are systematic and both statistically and climatically significant. By 2100, ESM2M exhibits 18% higher global steric sea level rise than ESM2G for all four radiative forcing scenarios (28 to 49 mm higher), despite having similar changes between the models in the near-surface ocean for several scenarios. These differences arise primarily from the vertical extent over which heat is taken up and the total heat uptake by the models (9% more in ESM2M than ESM2G). The fact that the spun-up control state of ESM2M is warmer than ESM2G also contributes, by giving thermal expansion coefficients that are about 7% larger in ESM2M than ESM2G. The differences between these models provide a direct estimate of the sensitivity of 21st century sea level rise to ocean model formulation, and, given the span of these models across the observed volume of the ventilated thermocline, may also approximate the sensitivities expected from uncertainties in the characterization of interior ocean physical processes. Krasting, John P., Anthony J Broccoli, Keith W Dixon, and John R Lanzante, October 2013: Future Changes in Northern Hemisphere Snowfall. Journal of Climate, 26(20), doi:10.1175/JCLI-D-12-00832.1. Using simulations performed with 18 coupled atmosphere-ocean global climate models from the CMIP5 project, projections of Northern Hemisphere snowfall under the RCP4.5 scenario are analyzed for the period 2006-2100. These models perform well in simulating 20th century snowfall, although there is a positive bias in many regions. Annual snowfall is projected to decrease across much of the Northern Hemisphere during the 21st century, with increases projected at higher latitudes. On a seasonal basis, the transition zone between negative and positive snowfall trends corresponds approximately to the -10 °C isotherm of the late 20th century mean surface air temperature such that positive trends prevail in winter over large regions of Eurasia and North America. Redistributions of snowfall throughout the entire snow season are projected to occur – even in locations where there is little change in annual snowfall. Changes in the fraction of precipitation falling as snow contribute to decreases in snowfall across most Northern Hemisphere regions, while changes in total precipitation typically contribute to increases in snowfall. A signal-to-noise analysis reveals that the projected changes in snowfall, based on the RCP4.5 scenario, are likely to become apparent during the 21st century for most locations in the Northern Hemisphere. The snowfall signal emerges more slowly than the temperature signal, suggesting that changes in snowfall are not likely to be early indicators of regional climate change. Shevliakova, Elena, Ronald J Stouffer, Sergey Malyshev, John P Krasting, G C Hurtt, and S W Pacala, October 2013: Historical warming reduced due to enhanced land carbon uptake. Proceedings of the National Academy of Sciences, 110(42), doi:10.1073/pnas.1314047110. Previous studies have demonstrated the importance of enhanced vegetation growth under future elevated atmospheric CO2 for 21st century climate warming. Surprisingly no study has completed an analogous assessment for the historical period, during which emissions of greenhouse gases increased rapidly and landuse changes (LUC) dramatically altered terrestrial carbon sources and sinks. Using the Geophysical Fluid Dynamics Laboratory comprehensive Earth System Model ESM2G and a reconstruction of the LUC, we estimate that enhanced vegetation growth has lowered the historical atmospheric CO2 concentration by 85 ppm, avoiding an additional 0.31 ± 0.06 °C warming. We demonstrate that without enhanced vegetation growth the total residual terrestrial carbon flux (i.e., the net land flux minus LUC flux) would be a source of 65–82 Gt of carbon (GtC) to atmosphere instead of the historical residual carbon sink of 186–192 GtC, a carbon saving of 251–274 GtC. Dunne, John P., Jasmin G John, Alistair Adcroft, Stephen M Griffies, Robert Hallberg, Elena Shevliakova, Ronald J Stouffer, William F Cooke, Krista A Dunne, Matthew J Harrison, John P Krasting, Sergey Malyshev, P C D Milly, Peter Phillipps, Lori T Sentman, Bonita L Samuels, Michael J Spelman, Michael Winton, Andrew T Wittenberg, and Niki Zadeh, October 2012: GFDL's ESM2 global coupled climate-carbon Earth System Models Part I: Physical formulation and baseline simulation characteristics. Journal of Climate, 25(19), doi:10.1175/JCLI-D-11-00560.1. We describe the physical climate formulation and simulation characteristics of two new global coupled carbon-climate Earth System Models, ESM2M and ESM2G. These models demonstrate similar climate fidelity as the Geophysical Fluid Dynamics Laboratory’s previous CM2.1 climate model while incorporating explicit and consistent carbon dynamics. The two models differ exclusively in the physical ocean component; ESM2M uses Modular Ocean Model version 4.1 with vertical pressure layers while ESM2G uses Generalized Ocean Layer Dynamics with a bulk mixed layer and interior isopycnal layers. Differences in the ocean mean state include the thermocline depth being relatively deep in ESM2M and relatively shallow in ESM2G compared to observations. The crucial role of ocean dynamics on climate variability is highlighted in the El Niño-Southern Oscillation being overly strong in ESM2M and overly weak ESM2G relative to observations. Thus, while ESM2G might better represent climate changes relating to: total heat content variability given its lack of long term drift, gyre circulation and ventilation in the North Pacific, tropical Atlantic and Indian Oceans, and depth structure in the overturning and abyssal flows, ESM2M might better represent climate changes relating to: surface circulation given its superior surface temperature, salinity and height patterns, tropical Pacific circulation and variability, and Southern Ocean dynamics. Our overall assessment is that neither model is fundamentally superior to the other, and that both models achieve sufficient fidelity to allow meaningful climate and earth system modeling applications. This affords us the ability to assess the role of ocean configuration on earth system interactions in the context of two state-of-the-art coupled carbon-climate models.